December was an incredibly busy and productive month for all here on the museum team. With 21 visiting cruise ships, and the calendar also full of many social activities, it has been a very eventful month! We began the month by hosting an explorers and whalers inspired dinner ‘Night at the Museum’ inspired by Grytviken’s past for all members of the community. The themed dinner menu offerings included hoosh and hard tack, whalers reindeer roast and for dessert a chocolate cake in the shape of an Elephant Seal weaner and bull! We made the most of a break between cruise ship visits during the middle of December to make a start on the annual deep clean of the museum. 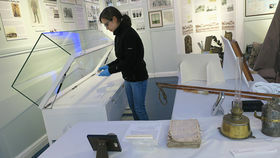 Led by our curator Charlotte, all hands were on deck to carefully clean each artefact and we have now completed half of the museum display areas. It was a great opportunity for all of us who work at the museum to get an up close and personal look at the artefacts and learn more about the items throughout the process from Charlotte. With Christmas fast approaching the community was invited to join us in decorating the church. 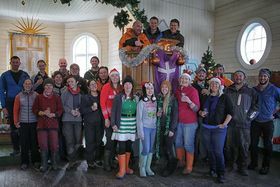 Volunteers that came to join us included the team from the British Antarctic Survey, government officers, visiting scientists and members of the SGHT Habitat Restoration team – aka Team Rat - who were back on base after completing the deployment of rat detection devices throughout the island and were now back for a well-deserved break. Everyone was rewarded with mulled wine, mince pies with brandy butter and treated to a soundtrack of classic Christmas music! Christmas came early for all of us with the arrival of many new people on Christmas Eve. In amongst the many new members arriving to the community was our eagerly awaited artist in residence, Theo Crutchley-Mack. 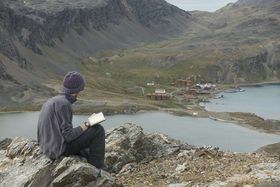 He wasted no time getting straight into creating amazing sketches inspired by the ruined buildings and abandoned whaling station here at Grytviken. We also welcomed the new members of the Habitat Restoration team, Team Dog! 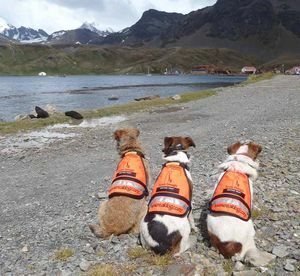 The 3 rat detection dogs and their handlers were most definitely amongst the most popular on base and have now joined Team Rat out in the field for the second half of Phase 4 of the Habitat Restoration Project. As 2017 was coming to a close the community hosted a football game on the 27th of December on the pitch behind the old whaling station, with crew and expedition staff from the cruise ship Bremen taking on the team Grytviken. The local team included, amongst others, the builders, the station leader, scientists and boatmen. The interesting and uneven pitch being full of burnet, rocks and muddy bog provided a very entertaining game to onlookers! The final score was 7:1, with the team from Grytviken claiming victory! This page was last modified 12:30, 9 January 2018. This page has been accessed 3,479 times.